A quality pad used under your rug helps protect it from damage, wear and slippage. Every rug needs one. For a flat weave, use rubber waffle pad and for a thick hand knotted or tufted, use rubber backed synthetic felt. Always replace the pad if the rug has had pet contamination. 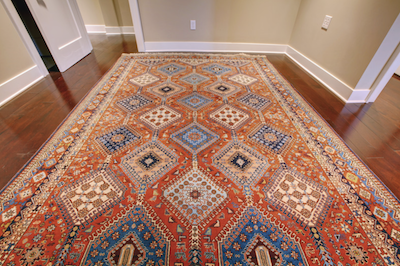 Like most carpeting, rugs should be vacuumed at least weekly to remove dry soil, lint, and hair. If in an entryway, vacuum more often. Be cautious not to vacuum the fringe with your brush bar! Use the end of a vacuum hose from a canister vacuum. Every few months turn the rug face down on a clean, dry smooth surface and vacuum to vibrate out the embedded dry soil.